Chief District Officer of Jumla Rudra Prasad Acharya inaugurates ambulance service in Kalikakhetu, Jumla. Women in this village give birth to their babies at home as there are no means to carry them safely to the hospital and health posts for safe delivery. This has been a major reason why the health of mother and the infant degrades after the birth of the baby. “As most of us are unaware about proper required for the nursing mother and the infant, they both get prone to various infections after a few days,” said Shahi. Lak Bahadu Shahi, a member of the Congress Nepali Mahasamiti of Wadki VDC, said, “This service has really brought a great excitement to the villagers. No patient in this locality will have to die because of lack of treatment.” He also informed that the charge for ambulance service will be determined as per the earning of the villagers. This service will be provided to 11 VDCs of Sija but the health post is planning to expand this service to more VDCs of the district. 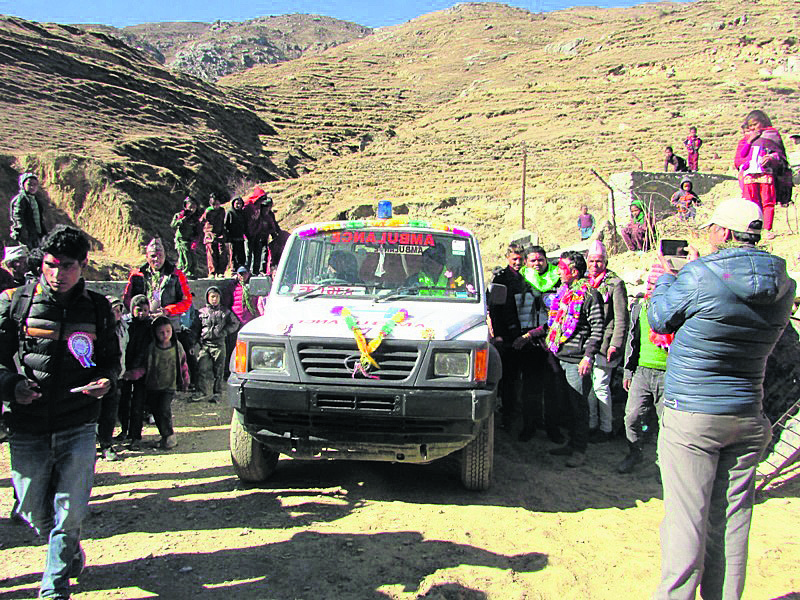 The ambulance service came into operation in Jumla with the support of the Embassy of India while the government of Nepal had waived the customs for the vehicle. Dr Kamal Prasad Acharya, in-charge of Kalikakhetu Primary Health Centre, was felicitated with garlands and colors by the locals for his initiative in starting the service in the remote district. Chief District Officer Rudra Prasad Adhikari inaugurated the service amid a function on Sunday. “This service will be ineffective if there aren't any proper roads in the villages,” said Dr Acharya. In a place where people have to walk miles to reach hospitals, this service has offered a hope to the locals. The distance in this remote district has always been a great problem for pregnant mothers and people with disabilities to reach hospitals. But this service has given a great respite to the locals. Locals of Kalikakhetu say that this is by far the best service provided by the health center for the sake of the people.